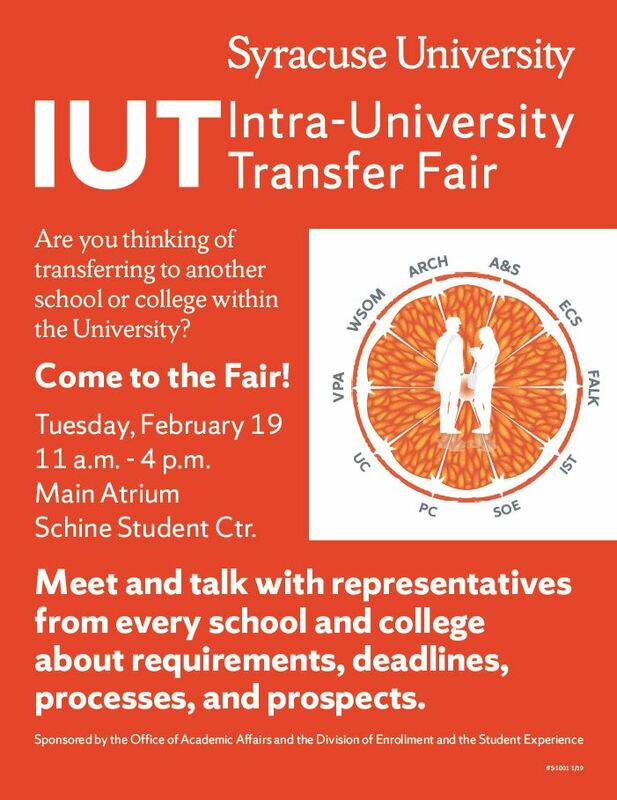 Syracuse University students thinking about transferring to another school or college within the University are encouraged to attend the Intra-University Transfer Fair (IUT) on Tuesday, Feb. 19, from 11 a.m. to 4 p.m. in the atrium of the Schine Student Center. The fair will give students the opportunity to ask questions about the many different majors offered campuswide and the academic rigor that each entails. Students will also be able to learn more about application deadlines and course requirements or a certain grade point average that may be needed to transfer. The fair is sponsored by the Office of Academic Affairs and the Division of Enrollment and the Student Experience.